Today, Wayne Barron provides a public service to many potential drum corps volunteers by discussing a program that allows members of certain organizations to work with youth without sacrificing their personal vacation time. I met Wayne in San Antonio this past summer, where he's lived for the past several years as a member of the United States Air Force. Here's what he has to say. I'm Wayne Barron, and I've been a volunteer staff member for the Madison Scouts from 1992 to 2002 -- 11 years of drum corps touring. What is unique about that fact is that I've been able to tour with the Scouts as an active duty member of the Air Force. I began helping the Scouts while I was stationed in Milwaukee. 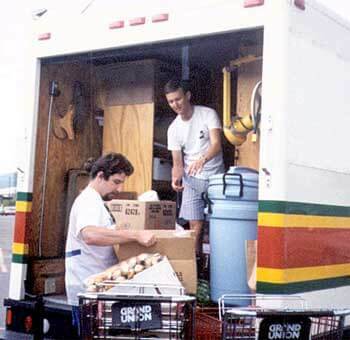 Wayne Barron (top) and Chris Parker (bottom) take time to load up Madison's food truck as they get ready to move on to the next stop. My first job was bingo. Great place to start, it only took a few Friday nights a month and I got a chance to meet some of the Scouts and the army of family and support staff members that helped Madison get down the road. I guess with my thick Southern accent, I made an impression -- I was asked to be a bingo caller. You've got to remember, I was born and raised in rural West Tennessee, so my accent is thick. Those folks from Madison didn't know what I was saying sometimes, but no one ever missed a "BINGO!" It was while I was working bingo that I was asked if I wanted to be on tour for a couple of weeks. Madison's food staff always needed some help and I wanted to get up close and personal to a drum corps since I had never marched. During the summer of 1992, I took 17 days of regular military leave -- the military only gives you 30 days of leave a year -- and off I went. Man, I had a blast. Space was tight, so I ended up on the drum bus with my seat partner, "Big Randy." OK, at the ripe age of 32 traveling through God-knows-where in the middle of night, on a bus, pinned against my window -- "WOW, this is drum corps." I guess I was doing something right, as after the 1992 season, I was asked to be on the Scouts' board of directors. It was a proud moment for me when Scott Stewart announced me as part of the 1993 board during the annual banquet. I'd worn my Air Force Service Dress to the banquet that night and there I was with all the Scouts family wearing my uniform and standing proud and tall. I toured for two years using 17 to 21 days of my regular leave. I had heard of a program called Permissive Temporary Duty (TDY), but could I use it for drum corps? Permissive TDY does not charge you leave when you're absent from duty. It's like an excused absence. After checking the Air Force Military Leave Program Instruction, Rule 31, I learned one was allowed Permissive TDY if the following conditions were met: "Participate as instructors or staff members of non-sectarian national youth organizations in direct support of sponsored encampments, conferences, established summer camps, and similar activities conducted under the auspices of, and approved by, a national youth organization." That sounded a lot like what drum corps was. Next, I had the director of the Madison Scouts write me a letter stating that I was a staff member. Since Drum Corps International is an international youth organization, I didn't have any problems meeting the criteria for Permissive TDY. Now for the hard part: I had to convince my supervisor and commander to approve my Permissive TDY. The Air Force Instruction allows for a maximum of 30 days of absence. I completed the forms and took my letter from the director and I asked my boss and the commander for 21 days of permissive TDY. I was approved and since 1994 I have used Permissive TDY to tour with drum corps. However, the Air Force mission always comes first and I've had to shuffle my plans sometimes due to duty commitments. The Air Force instruction goes on to say, "Commanders should make effort to support those programs that directly benefit the base and its local communities." I know for a fact there have been several members that have aged out of Madison and joined the military. Some Air Force, Army, Navy and Marines, but I know that as an active-duty military person I was living proof that you can serve your country and still have free time to follow activities you love. My days as a volunteer are coming to an end. I'm a chief master sergeant in the Air Force, and finding the time to take Permissive TDY is becoming increasingly harder. I just can't afford to take off two weeks and go tour like I could a few years ago. Touring with drum corps, I've seen more of the United States than anyone else I know. Even when I was stationed in Iceland in 1998, I still came back and toured 21 days with the Scouts. What a great summer that was -- Iceland to California! WOW. Sometimes I don't know why I keep touring. The military way of life is all I've know for the past 25 years. We all know that deep down in drum corps are military roots -- structure and everyone being responsible for themselves. The drum corps lifestyle fits me like a glove. My primary job since 1993 has been to drive the Madison food truck, "Panther Four." Driving the truck was a piece of cake -- it was getting it loaded that could sometimes be "fun." When you're late and the corps is pulling out in 15 minutes, the military man in me comes out quick. That military leadership and ability to get things organized quickly ensures floors get mopped, and tables, pots, plates, cups, etc., are loaded with military precision and it's done quickly. A funny thing happened on my way to checking out a drum corps. I got hooked and wanted to learn more and more about it. I never marched Madison, but in 1996 after five years on tour, Scott Stewart walked up to me with a smile on his face and was holding one of those Scouts green jackets. He told me to try it on. It was a perfect fit. He gave me a hug and told me to wear it because I'd earned it. My most special moment in drum corps happened that summer in 1996 in Orlando. I was on the field with the staff during the medal presentation. Of course, the staff passed out the medals to the corps members. I was asked to present one of the medals. It was to one of my first friends I'd met in Madison back in 1992, Tim Barstow. 1996 was his age-out year. I trooped the field and found Tim; it was my honor to present him with his finals medallion of 1996. But wait, the best part is still come. As the corps left the field, Madison gathered up in that manly huddle with brothers arm-in-arm. Since I never marched, I never joined the huddle – I just stood off to the back. There was something electric in the air that night, and several of the corps guys pulled me into the huddle. There I was standing next to Tim, Scott Stewart, and Tony Rother, the drum major, and I knew was about the happen. We were arm-in-arm, and then it began. It started very low almost like a vibration then the words came into full bloom. The corps was singing "You'll Never Walk Alone." I had head the song hundreds of times before, but this time, instead of being on the outside looking in, I was in the huddle as a part of the Madison Scouts. I can't describe the emotions of then a 36-year-old Air Force man. I just know that it was one of those once-in-a-lifetime moments. There wasn't a dry eye around and it was one of those moments that make the Madison Scouts a class act. If you ever thought about volunteering to help a drum corps, do it! I still talk with Scott Stewart and my friend Tim Barstow. For a person that never marched corps, I sure do feel part of one. Many companies have policies that allow its workers time off work to support youth activities. I know my company, the Air Force, has a great program. Each year I see more and more of my Air Force friends on tour supporting their favorite corps, and yes, we're all on Permissive TDY if we can get it. You don't know until you ask.